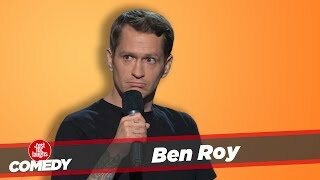 Taking comedy audiences by storm since 2004, Ben Roy brings an unparalleled energy and unique voice to stage. Often compared to Louis Black or Bill Hicks due to his passionate, ranting approach, Roy has a style that is definitively his own. Equal amounts aggression and engagement, acerbic wit and magnetic charm, Roy tempers the volume and intensity of his delivery with a deep intelligence and undeniable likability.Originally from Winthrop, Maine, Roy cut his comedic teeth in Denver at the renowned club Comedy Works. He has been selected to perform at the Montreal Just for Laughs Comedy Festival, Bridgetown Comedy Festival, LA Riot Comedy Festival, Boston Comedy Festival, Cape Fear Comedy Festival, and many more. Roy is also one of the only (if not the only) person to be invited to Austin’s illustrious South by Southwest festival to perform as both a musician and a stand-up comedian in the same year. He's also been featured on HBO's Funny as Hell series; in the John Wenzel Book Mock Stars: Indie Comedy and Dangerously Funny (alongside comedy greats like Patton Oswalt and Fred Armisen); and on the Comedy Central Shows Adam DeVine's House Party and This Is Not Happening.In June 2012, Roy and fellow Denver Comedians Adam Cayton-Holland and Andrew Orvedahl (who collectively perform as The Grawlix) produced a pilot for Amazon called Those Who Can’t, a comedy about three inept Denver high school teachers. While Amazon eventually passed on the pilot, truTV paid the trio to rewrite and re-film it in December of 2014. The first season of the series aired in spring 2016, the second season in fall 2016, and the trio is currently filming the third season, to debut later in 2017.